The speakers include representatives from IBM Innovation Center, the Western New York Land Conservancy, and AAA as well as from colleges and universities across the United States. This diverse group of people is meeting to explore how higher education can best prepare students for careers in data analytics. The occasion is the Data Analytics across Disciplines conference to be held at the Conference and Event Center in Niagara Falls on May 18 and 19. 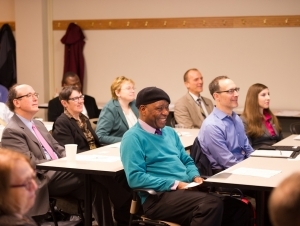 The conference is sponsored by the National Professional Science Master’s Association (NPSMA), the SUNY Professional Science Master’s Consortium, and Buffalo State. Joaquin Carbonara, professor of mathematics, is director of the SUNY consortium as well as a member of NPSMA’s executive board and proponent of the professional science master’s movement. Data analytics is the discipline that takes raw data and turns it into information that’s useful to an organization. Buffalo State is now accepting applications for a data analytics curriculum to be offered through its multidisciplinary program in fall 2016. “Whether your industry is health care, banking, or education, you need people who can do data wrangling,” said Carbonara. “That’s the art of extracting, cleaning, organizing, and applying data in a way that transforms it to information. That information can provide valuable insights to the decision makers in an organization.” The purpose of the conference is to identify industry’s needs and develop ways to provide a meaningful program to students, and to demonstrate the usefulness of such programs to for-profit, government, and not-for-profit organizations. Jay Goodwyn, executive director of the IBM Buffalo Innovation Center, is the keynote speaker for the first of four sessions at the conference. The other speakers are Uma Gupta, professor of business at Buffalo State; Peter L. Elkin, professor and chair of the Department of Biomedical Informatics at the University at Buffalo; and Dennis Atkinson, manager of the Western New York Regional Information Center's Data Warehouse and Test Scoring departments, and Tim Johnson, developer in curriculum, instruction, and data analysis, both from Erie 1 Board of Cooperative Educational Services. Taken together, the presentations shed light on the need for, and use of, data analytics. Data analytics requires three skills. Two are math/statistics and computer science; the third is “domain knowledge”—knowledge of the specific industry seeking to make sense of the data it can access. The conference will include two tracks. One focuses on data analytics in professional science master’s (PSM) programs. A PSM program is developed in concert with industry, and is designed to fill the need for managers in STEM-related organizations or departments. PSM programs incorporate business skills with expertise in a STEM discipline—in this case, data analytics—while emphasizing experiential learning. Another track describes the application of data analytics to real problems not only in business and science but also in the provision of social services. Registration is open until May 13. For more information, please contact Carbonara at (716) 878-6423.